I’m still in Key West where all winter we’ve been eating outside on the deck. Our friends Liz and Todd made a St. Patrick’s Day dinner of corned beef and cabbage, carrots, potatoes and homemade bread. The table on their deck was too small for our party of eight so Todd set out to find a piece of plywood the right size to put on top of the existing table. Tip: It’s easy to do this for temporary use and then store the wood for another time. On the way to the local lumberyard he passed an elementary school with a sign out front, “Free Tables”. 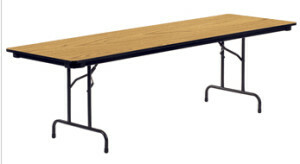 Remember those long, narrow tables with metal fold down legs at each end? 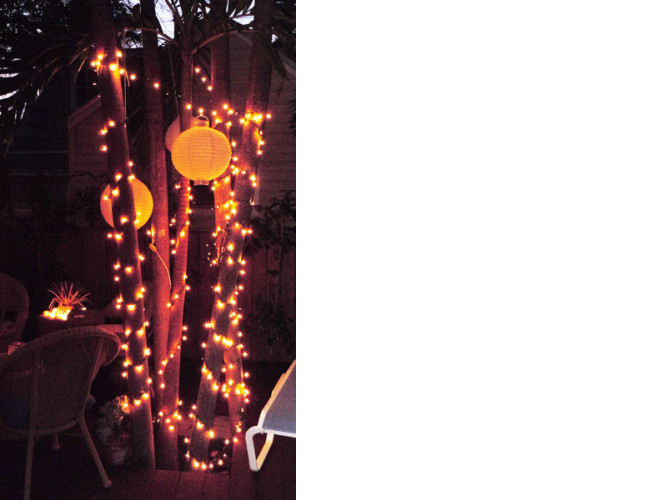 Who knew they had decorating potential! Pays to keep your antennae up and an open mind. 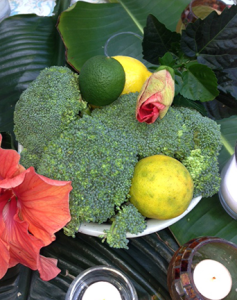 Covered with a piece of yellow remnant fabric, Liz set the table with green Fiestaware plates. She filled a yellow pitcher with green artificial pompom flowers from the Dollar Tree store for the centerpiece. Tip: I might have used a large bunch of broccoli. Great recycling potential! 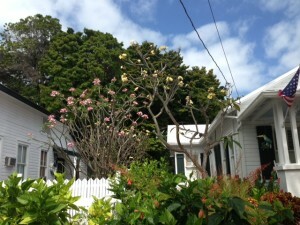 The Frangipani trees are blossoming all over town. Down here we all live in smaller houses than we have at home. It’s challenging to prepare and serve even a simple meal without your “go to stuff,” But it’s also liberating. You get good at improvising. No one has attitude or expectations! 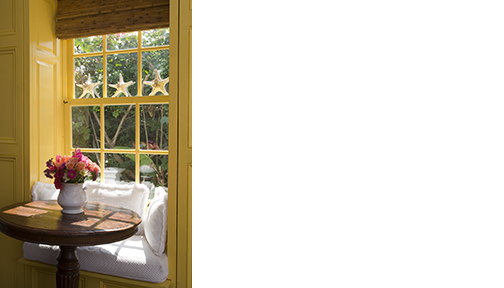 Last year I wrote several articles on lifestyles in small houses for Nantucket Living Magazine, The homeowners gave me great tips for solving problems like storage, how to entertain, decorate, furnish, display art, etc. in small spaces. 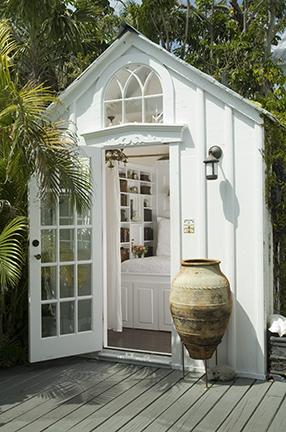 Even if your home isn’t teeny tiny there are some good ideas for all of us who know that nesting is not for the birds. Here are some tips from small homeowners that I find useful and not just run-of-the-mill obvious. Paint molding and trims on windows same color as ceiling. Or use the same color for molding and walls, making one a slightly darker shade than the other. Don’t pretend the house is larger than it is and cram it with stuff. Embrace the cottage feeling. Make it intimate and play up its positive qualities. Use over-sized mirrors on one wall to create a feeling of space. On a narrow stairway (often found in early cottages) consider botanical prints in mirrored frames or even a group of small, framed mirrors on the stairway wall. Carpet a stairway with a runner, never end to end. Leave wood on both sides showing to make stairs seem wider. Anchor the room with comfortable pieces first then add small occasional chairs, side tables and accessories. Plantation shutters are good for window covering. Practical, contemporary and retro at the same time Sleek AND cottagey. Mix really good pieces with yard sale finds. For example, you could find one of those school tables, faux finish or paint the top with an interesting glossy coat of paint, spray paint the legs another color and place a wonderful oversized piece of pottery in the center. Add an orchid in the pot and you’ve created interesting rather than poverty style. 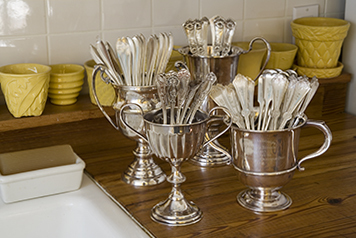 Make sure every item in the house is aesthetically pleasing as well as functional. Tips from two cooks who set up a tiny galley kitchen for maximum efficiency:. 1.Buy the best of everything so you only need one. Have the right size good pots and skillets. 2. Butcher block counter top is good for prep work. 3. Hang a narrow shelf above the sink with a wine glass rack underneath. The shelf holds things not used all the time and the glasses are out of the way but convenient. Rinse and hang up to dry. 4. Bunch all cooking utensils like wooden spoons, etc. in a good looking crock, pitcher or basket on the counter. 5. Modular storage containers organize everything. If you can’t use it lose it.